GoPro has been on a steady downward slope for the past few years, at least as far as profits go. The company laid off 100 workers in January 2016 in response to weak sales. This continued in November 2016 with another 200 layoffs, followed by 270 more the following March. The situation doesn't seem to be improving, so GoPro is leaving the drone market entirely, and cutting more jobs in the process. The company announced the move in its preliminary Q4 2017 results. GoPro said it faced challenges "in an extremely competitive aerial market," and claims "a hostile regulatory environment in Europe and the United States" would reduce profits if it chose to continue manufacturing drones. In reality, trying to compete with DJI and other top drone makers would have been extremely difficult, and GoPro wasn't willing to keep up the fight. The company plans to sell its remaining inventory of Karma drones, and will continue supporting it for the foreseeable future. As a result of leaving the drone market, GoPro will cut almost 300 jobs, including some executives. The company is also dropping the price of the Hero6 Black camera (pictured above) from $499 to $399, in an effort to increase sales. GoPro CEO and Founder Nick Woodman is cutting his annual pay to $1, and told CNNMoney he is open to selling the company. In an interview, he said, "If there was an opportunity to merge GoPro with a larger parent company that could help us scale our business and provide a better return on investment [...] we would welcome the opportunity to explore such an opportunity." Woodman said the company is not actively pursuing a sale, but it has started working with JPMorgan Chase to explore possible options. SAN MATEO, Calif., Jan. 8, 2018 /PRNewswire/ -- GoPro, Inc. (NASDAQ: GPRO) today reported certain preliminary financial results for the fourth quarter ended December 31, 2017. GoProexpects revenue to be approximately $340 million for the fourth quarter of 2017. Fourth quarter revenue includes a negative impact of approximately $80 million for price protection on HERO6 Black, HERO5 Black and HERO5 Session cameras, as well as the Karma drone. "As we noted in our November earnings call, at the start of the holiday quarter we saw soft demand for our HERO5 Black camera," said GoPro founder and CEO Nicholas Woodman. "Despite significant marketing support, we found consumers were reluctant to purchase HERO5 Black at the same price it launched at one year earlier. Our December 10 holiday price reduction provided a sharp increase in sell-through." Sales of the newly introduced flagship HERO6 Black camera performed as expected during the fourth quarter. On January 7, GoPro lowered the price of its premium model, HERO6 Black from $499 to $399 to align with its good, better, best product strategy. Initial uptake of GoPro's newly launched spherical camera, Fusion, was better than expected during the quarter. "GoPro is committed to turning our business around in 2018," said Nicholas Woodman. "We entered the new year with strong sell-through and are excited with our hardware and software roadmap. We expect that going forward, our roadmap coupled with a lower operating expense model will enable GoPro to return to profitability and growth in the second half of 2018." 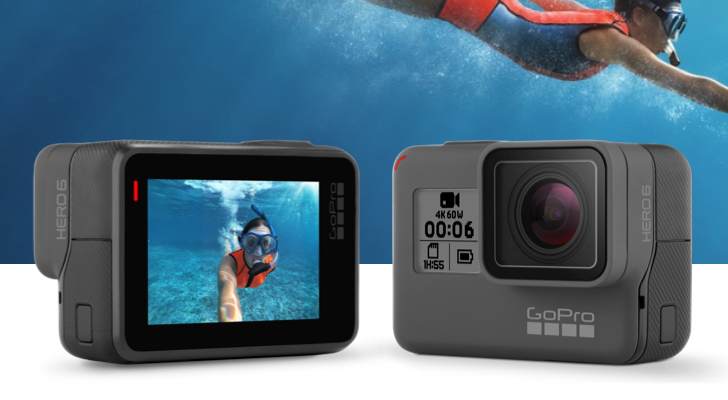 In 2018, GoPro will continue to innovate with several new products aimed at new and existing customers. GoPro's sharper focus will enable an $80 million reduction in operating expenses compared to 2017 levels, resulting in a target operating expense level of below $400 million for 2018 on a non-GAAP basis. A restructuring of GoPro's business will result in an estimated aggregate charge of $23 million to $33 million, including approximately $13 million to $18 million of cash expenditures as a result of a reduction in force, substantially all of which are severance and related costs, as well as approximately $10 million to $15 million of other charges, consisting primarily of non-cash items. GoPro expects to recognize most of the restructuring charges in the first quarter of 2018. GoPro will provide more detail on its 2017 results and 2018 outlook in its fourth quarter earnings report which will take place in early February. GoPro reports gross margin and operating expenses in accordance with U.S. generally accepted accounting principles (GAAP) and on a non-GAAP basis. Non-GAAP items exclude, where applicable, the effects of stock-based compensation, acquisition-related costs, restructuring costs and aerial-related charges. A reconciliation of preliminary 2017 GAAP financial measures to non-GAAP financial measures is presented below. A reconciliation to 2018 target GAAP operating expense has not been provided because doing so would require an unreasonable effort due to the unavailability of information needed to calculate reconciling items and due to the variability, complexity and limited visibility of the adjusting items that would be excluded from the non-GAAP financial measures in future periods. When planning, forecasting and analyzing operating expenses for future periods, GoPro does so primarily on a non-GAAP basis without preparing a GAAP analysis as that would require estimates for reconciling items which are inherently difficult to predict with reasonable accuracy.